We had some friends in town from Missouri last weekend and did our best to show them some southern hospitality. Anna and Brandon are such a great couple and we really enjoyed showing them around our neck of the woods. The very next day Charlotte got it's 1st snowfall of the day. 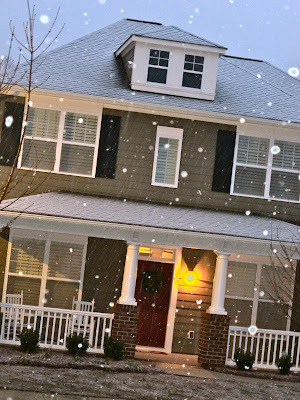 (I swear I was just wearing flip flops and sipping a mimosa at an outdoor lakefront patio the afternoon before) This was our 1st snow in our new house and we think it looks just beautiful! We love dominos! :) looks like y'all had a great time! My cousins own Cauble Creek Vineyards in Rowan County, you should check it out sometime! I'm jealous you got to enjoy the snow, It wasn't fun driving back to Kentucky in it, after my weekend in Charlotte with family. my six hour trip took ten hours! But I loved being at my second "home" for the weekend. have a great week! It was the same way in Raleigh! It was 65 degrees on sat and then it freaking snowed and sleeted on Sun night... It was crazy!! looks like such a fun time! i love the black and white picture of you kneeling down. so pretty!!! i also love your house! Dominoes! Awesome way to pass time. Do you guys slam it down on the table for that sound effect like we do? Your house is soo cute!! Love that kitchen and all those windows in the living room! And I am so jealous of that snow. Perfect! Sounds like a fun filled weekend. I love the picture of the front of your house with the snow falling:) So glad yall are making all these memories in your new home!!! I just love your house!!!!!!! I can't decide if I was happy that I was enjoying 70 degree weather while it was snowing in Charlotte or sad that I probably won't see snow for at least 3 years.... either way, I'm glad you had a great time with your friends! Your pictures are always beautiful. i love ethis :) what a great time you all seemed to have :) love the pics! Yay for quality time with good friends! As for that snowfall, you captured it beautifully :) I'll pass on the snow though. Had enough of that up in 'cuse! First off, you always have gorgeous hair! You've got the wave thing down! The lake pictures are so pretty! It looked like a beautiful day to be there. Looks like you had such a good time! Your house is beautiful! Looks like such a fun weekend! That snow looks beautiful! We haven't had much this year, and I can't believe I'm admitting this...but I kind of miss it! I just love your house... it's so pretty! Where is your rug from? Great pictures! It looks like you had such a great time. And your hair is really pretty! Your house is beautiful! I love the porch. I told Brian that when we move into a house, the only requirement for me is a big porch! Love it! You look gorgeous! Love the pics! we kinda love each other. like, a lot. when so cal comes to clt, we're there with bells!